Tagalog is an Austronesian language spoken as a first language by a quarter of the population of the Philippines and as a second language by the majority. Its standardized form, officially named Filipino, is the national language of the Philippines, and is one of two official languages alongside English. Intramuros is the 0.67 square kilometres (0.26 sq mi) historic walled area within the modern city of Manila, the capital of the Philippines. It is administered by the Intramuros Administration (IA), which was created through the Presidential Decree No. 1616 signed on April 10, 1979. IA is tasked to rebuild, redevelop, administer and preserve the remaining pre-war buildings, structures and fortifications of Intramuros. Mega Manila is the term used for the megalopolis in the Philippine regions of Central Luzon, Calabarzon, Mimaropa and Metro Manila. 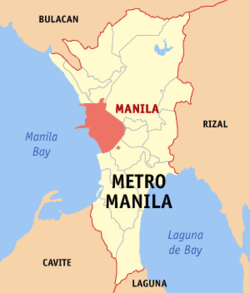 It is frequently used in the press, advertising, television, and radio to refer to provinces bound to Manila, in contrast to the term Greater Manila Area, which is academically used to describe the urbanization process that has long spilled out of Metro Manila's borders, also known as the built-up area. Mapping out the built-up area around Manila requires finer granularity than the more generic term Mega Manila. Metropolitan Manila, officially the National Capital Region (NCR), is the seat of government and one of the three defined metropolitan areas of the Philippines. It is composed of 16 cities namely: the City of Manila, Quezon City, Caloocan, Las Piñas, Makati, Malabon, Mandaluyong, Marikina, Muntinlupa, Navotas, Parañaque, Pasay, Pasig, San Juan, Taguig, and Valenzuela, as well as the municipality of Pateros. Manila Bay is a natural harbour which serves the Port of Manila, in the Philippines. Strategically located around the capital city of the Philippines, Manila Bay facilitated commerce and trade between the Philippines and its neighbouring countries, becoming the gateway for socio-economic development even prior to Spanish occupation. With an area of 1,994 km2 (769.9 sq mi), and a coastline of 190 km (118.1 mi), Manila Bay is situated in the western part of Luzon and is bounded by Cavite and Metro Manila on the east, Bulacan and Pampanga on the north, and Bataan on the west and northwest. Manila Bay drains approximately 17,000 km2 (6,563.7 sq mi) of watershed area, with the Pampanga River contributing about 49% of the freshwater influx. With an average depth of 17 m (55.8 ft), it is estimated to have a total volume of 28.9 billion cubic metres. Entrance to the bay is 19 km (11.8 mi) wide and expands to a width of 48 km (29.8 mi). However, width of the bay varies from 22 km (13.7 mi) at its mouth and expanding to 60 km (37.3 mi) at its widest point. The Pasig River is a river in the Philippines that connects Laguna de Bay to Manila Bay. Stretching for 25 kilometres (15.5 mi), it bisects the Philippine capital of Manila and its surrounding urban area into northern and southern halves. Its major tributaries are the Marikina River and San Juan River. The total drainage basin of Pasig River, including the basin of Laguna de Bay, covers 4,678 square kilometres (1,806 sq mi). Binondo is a district in Manila and is referred to as the city's Chinatown and is the world's oldest Chinatown. Its influence extends beyond to the places of Quiapo, Santa Cruz, San Nicolas and Tondo. It is the oldest Chinatown in the world, established in 1594 by the Spaniards as a settlement near Intramuros but across the Pasig River for Catholic Chinese, it was positioned so that colonial rulers could keep a close eye on their migrant subjects. It was already a hub of Chinese commerce even before the Spanish colonial period. Binondo is the center of commerce and trade of Manila, where all types of business run by Filipino-Chinese thrive. Maynilà, the Filipino name for the city, comes from the phrase may-nilà, which translates to "where indigo is found." Nilà is derived from the Sanskrit word nīla ( नील ) which refers to indigo, and, by extension, to several plant species from which this natural dye can be extracted. The Maynilà name is more likely in reference to the presence of indigo-yielding plants growing in the area surrounding the settlement, rather than Maynilà being known as a settlement that trades in indigo dye. This is because the settlement was founded several hundred years before indigo dye extraction became an important economic activity in the area in the 18th century. The native Tagalog name for the indigo plant, tayum (or variations thereof)   actually finds use in another toponym within the Manila area — Tayuman ("where the indigo [plant] is") — and elsewhere in the Philippines (e.g., Tayum, Abra; Tagum, Davao del Norte). Indigo dye is an organic compound with a distinctive blue color. Historically, indigo was a natural dye extracted from the leaves of certain plants, and this process was important economically because blue dyes were once rare. A large percentage of indigo dye produced today, several thousand tonnes each year, is synthetic. It is the blue often associated with denim cloth and blue jeans. From a linguistic perspective it is unlikely for native Tagalog speakers to completely drop the final consonant /d/ in nilad to arrive at the present form Maynilà. As an example, nearby Bacoor still retains the final consonant of the old Tagalog word bakoód ("elevated piece of land"), even in old Spanish renderings of the placename (e.g., Vacol, Bacor). Historians Ambeth Ocampo   and Joseph Baumgartner  have also found that in all early documents, the place had always been written without the final /d/, thereby making the may-nilad etymology spurious. On June 24, 1571, the conquistador Miguel López de Legazpi arrived in Manila and declared it a territory of New Spain (Mexico), establishing a city council in what is now the district of Intramuros. He took advantage of a Tondo vs Manila territorial conflict to justify expelling or converting Bruneian Muslim colonists who supported their Manila vassals while his Mexican grandson Juan de Salcedo had a romance with a princess of Tondo, Kandarapa. López de Legazpi had the local royalty executed or exiled after the failure of the Conspiracy of the Maharlikas, a plot wherein an alliance between datus, rajahs, Japanese merchants and the Sultanate of Brunei would band together to execute the Spaniards, along with their Latin American recruits and Visayan allies. The victorious Spaniards made Manila, the capital of the Spanish East Indies and of the Philippines, which their empire would control for the next three centuries. In 1574, Manila was temporarily besieged by the Chinese pirate Lim Hong, who was ultimately thwarted by the local inhabitants. Upon Spanish settlement, Manila was immediately made, by papal decree, a suffragan of the Archdiocese of Mexico. Then, by royal decree of Philip II of Spain, the city of Manila was put under the spiritual patronage of Saint Pudentiana and Our Lady of Guidance (Spurred by a locally found sacred image worshiped by the natives which was interpreted to be Marian in nature, discovered at the cusp of the Miguel de Legazpi expedition). After Mexico gained independence in 1821, Spain began to govern Manila directly. 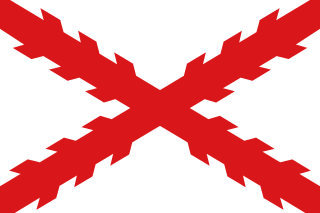 Under direct Spanish rule, banking, industry and education flourished more than they had in the previous two centuries. The opening of the Suez Canal in 1869 facilitated direct trade and communications with Spain. The city's growing wealth and education attracted indigenous peoples, Negritos, Malays, Africans, Chinese, Indians, Arabs, Europeans, Latinos and Papuans from the surrounding provinces  and facilitated the rise of an ilustrado class that espoused liberal ideas: the ideological foundations of the Philippine Revolution, which sought independence from Spain. A revolt by Andres Novales was inspired by the Latin American wars of independence. 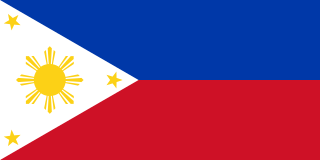 Following the Cavite Mutiny and the Propaganda Movement, the Philippine revolution eventually erupted, Manila was among the first eight provinces to rebel and thus their role was immortalized in the Philippine Flag where Manila was marked as one of the eight rays of the symbolic sun. After the 1898 Battle of Manila, Spain ceded Manila to the United States. The First Philippine Republic, based in nearby Bulacan, fought against the Americans for control of the city. The Americans defeated the First Philippine Republic and captured President Emilio Aguinaldo, who declared allegiance to the United States on April 1, 1901. From February 3 to March 3, 1945, Manila was the site of the bloodiest battle in the Pacific theater of World War II. Some 100,000 civilians were killed in February. At the end of the battle, Manila was recaptured by joint American and Philippine troops. It was the second most devastated city in the world, after Warsaw, during the Second World War. Almost all of the structures in the city, particularly in Intramuros, were destroyed. In 1948, President Elpidio Quirino moved the seat of government of the Philippines to Quezon City, a new capital in the suburbs and fields northeast of Manila, created in 1939 during the administration of President Manuel L. Quezon. The move ended any implementation of the Burnham Plan's intent for the government centre to be at Luneta. With the Visayan-born Arsenio Lacson as its first elected mayor in 1952 (all mayors were appointed before this), Manila underwent The Golden Age,  once again earning its status as the "Pearl of the Orient", a moniker it earned before the Second World War. After Lacson's term in the 1950s, Manila was led by Antonio Villegas for most of the 1960s. Ramon Bagatsing (an Indian-Filipino) was mayor for nearly the entire 1970s until the 1986 People Power Revolution. Mayors Lacson, Villegas, and Bagatsing are collectively known as the "Big Three of Manila" for their contribution to the development of the city and their lasting legacy in improving the quality of life and welfare of the people of Manila. Manila is hit with five to seven typhoons yearly. In 2009, Typhoon Ketsana (Ondoy) struck the Philippines. It led to one of the worst floodings in Metro Manila and several provinces in Luzon with an estimated damages worth ₱11 billion ($237 million). The floodings caused 448 deaths in Metro Manila alone. Following the aftermath of Typhoon Ketsana, the city began to dredge its rivers and improve its drainage network. Manila is a planned city. In 1905, American Architect and Urban Planner Daniel Burnham was commissioned to design the new capital. His design for the city was based on the City Beautiful movement, which features broad streets and avenues radiating out from rectangles. The city is made up of fourteen city districts, according to Republic Act No. 409—the Revised Charter of the City of Manila—the basis of which officially sets the present-day boundary of the city. Two districts were later created, which are Santa Mesa (partitioned off from Sampaloc) and San Andres (partitioned off from Santa Ana). Manila is known for its eclectic mix of architecture that shows a wide range of styles spanning different historical and cultural periods. Architectural styles reflect American, Spanish, Chinese, and Malay influences. Prominent Filipino architects such as Antonio Toledo, Felipe Roxas, Juan M. Arellano and Tomás Mapúa have designed significant buildings in Manila such as churches, government offices, theaters, mansions, schools and universities. 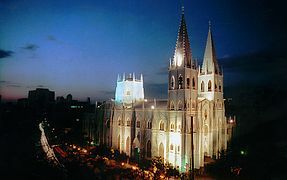 Manila is the seat of prominent Catholic churches and institutions. There are 113 Catholic churches within the city limits; 63 are considered as major shrines, basilicas, or a cathedral. The Manila Cathedral is the seat of the Roman Catholic Archdiocese of Manila and the oldest established church in the country. 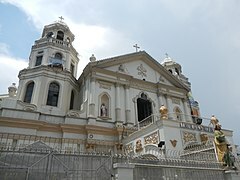 Aside from the Manila Cathedral, there are also three other basilicas in the city: Quiapo Church, Binondo Church, and the Minor Basilica of San Sebastián. The San Agustín Church in Intramuros is a UNESCO World Heritage Site and is one of the two fully air-conditioned Catholic churches in the city. 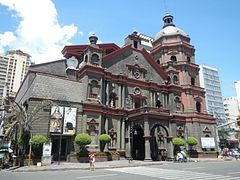 Manila also has other parishes located throughout the city, with some of them dating back to the Spanish Colonial Period when the city serves as the base for numerous Catholic missions both within the Philippines and to Asia beyond. The Port of Manila is the largest seaport in the Philippines, making it the premier international shipping gateway to the country. The Philippine Ports Authority is the government agency responsible to oversee the operation and management of the ports. The International Container Terminal Services Inc. cited by the Asian Development Bank as one of the top five major maritime terminal operators in the world   has its headquarters and main operations on the ports of Manila. Another port operator, the Asian Terminal Incorporated, has its corporate office and main operations in the Manila South Harbor and its container depository located in Santa Mesa. The Pandacan Oil Depot houses the storage facilities and distribution terminals of the three major players in the country's petroleum industry, namely Caltex Philippines, Pilipinas Shell and Petron Corporation. The oil depot has been a subject of various concerns, including its environmental and health impact to the residents of Manila. The Supreme Court has ordered that the oil depot to be relocated outside the city by July 2015,   but it failed to meet this deadline. Most of the oil depot facility inside the 33 hectare compound have been demolished, and plans are put into place to transform it into a transport hub or even a food park. Manila is a major publishing center in the Philippines. Manila Bulletin , the Philippines' largest broadsheet newspaper by circulation, is headquartered in Intramuros. Other major publishing companies in the country like The Manila Times , The Philippine Star and Manila Standard Today are headquartered in the Port Area. The Chinese Commercial News , the Philippines' oldest existing Chinese-language newspaper, and the country's third-oldest existing newspaper  is headquartered in Binondo. 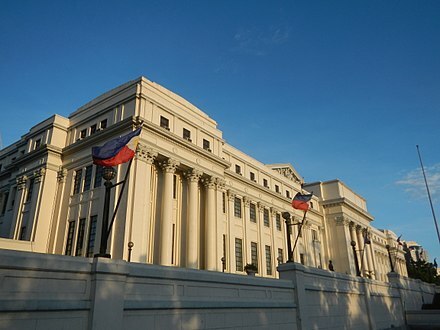 Manila serves as the headquarters of the Central Bank of the Philippines which is located along Roxas Boulevard. Some universal banks in the Philippines that has its headquarters in the city are the Landbank of the Philippines and Philippine Trust Company. Unilever Philippines used to have its corporate office along United Nations Avenue in Paco before transferring to Bonifacio Global City in 2016. Toyota, a company listed in the Forbes Global 2000, also has its regional office along UN Avenue. Rizal Park, also known as Luneta Park, is the national park and the largest urban park in Asia  with an area of 58 hectares (140 acres),  The park was constructed as an honor and dedication to the country's national hero José Rizal, who was executed by the Spaniards on charges of subversion. The flagpole west of the Rizal Monument is the Kilometer Zero marker for distances to the rest of the country. The park was managed by the National Parks and Development Committee. The 0.67 square kilometers (0.26 sq mi) Walled City of Intramuros is the historic center of Manila. It is administered by the Intramuros Administration, an attached agency of the Department of Tourism. It contains the famed Manila Cathedral and the 18th Century San Agustin Church, a UNESCO World Heritage Site. Kalesa is a popular mode of transportation for tourists in Intramuros and nearby places including Binondo, Ermita and Rizal Park. Known as the oldest chinatown in the world, Binondo was established on 1521 and it was already a hub of Chinese commerce even before the Spaniards colonized the Philippines. Its main attractions are Binondo Church, Filipino-Chinese Friendship Arch, Seng Guan Buddhist temple and authentic Chinese restaurants. Manila is regarded as one of the best shopping destinations in Asia. Major shopping malls, department stores, markets, supermarkets and bazaars thrive within the city. One of the city's famous shopping destinations is Divisoria, home to numerous shopping malls in the city, including the famed Tutuban Center and the Lucky Chinatown Mall. It is also dubbed as the shopping mecca of the Philippines where everything is sold at bargain price. There are almost 1 million shoppers in Divisoria according to the Manila Police District. Binondo, the oldest Chinatown in the world,  is the city's center of commerce and trade for all types of businesses run by Filipino-Chinese merchants with a wide variety of Chinese and Filipino shops and restaurants. Quiapo is referred to as the "Old Downtown", where tiangges, markets, boutique shops, music and electronics stores are common. C.M. Recto Avenue is where lots of department stores are located. Robinsons Place Manila is the largest shopping mall in the city. The mall was the second and the largest Robinsons Malls built. SM Supermall operates two shopping malls in the city which are the SM City Manila and SM City San Lazaro. SM City Manila is located on the former grounds of YMCA Manila beside the Manila City Hall in Ermita, while SM City San Lazaro is built on the site of the former San Lazaro Hippodrome in Sta. Cruz. The building of the former Manila Royal Hotel in Quiapo, which is famed for its revolving restaurant atop, is now the SM Clearance Center that was established in 1972. The site of the first SM Store is located at Carlos Palanca Sr. (formerly Echague) Street in San Miguel. Sports in Manila have a long and distinguished history. The city's, and in general the country's main sport is basketball, and most barangays have a basketball court or at least a makeshift basketball court, with court markings drawn on the streets. Larger barangays have covered courts where inter-barangay leagues are held every summer (April to May). Manila has many sports venues, such as the Rizal Memorial Sports Complex and San Andres Gym, the home of the now defunct Manila Metrostars. The Rizal Memorial Sports Complex houses the Rizal Memorial Track and Football Stadium, the Baseball Stadium, Tennis Courts, Memorial Coliseum and the Ninoy Aquino Stadium (the latter two are indoor arenas). The Rizal complex had hosted several multi-sport events, such as the 1954 Asian Games and the 1934 Far Eastern Games. Whenever the country hosts the Southeast Asian Games, most of the events are held at the complex, but in the 2005 Games, most events were held elsewhere. The 1960 ABC Championship and the 1973 ABC Championship, forerunners of the FIBA Asia Championship, was hosted by the complex, with the national basketball team winning on both tournaments. The 1978 FIBA World Championship was held at the complex although the latter stages were held in the Araneta Coliseum in Quezon City, Southeast Asia's largest indoor arena at that time. Manila celebrates civic and national holidays. Since most of the city's citizens are Roman Catholics as a result of the Spanish colonization,  most of the festivities are religious in nature. Manila Day, which celebrates the city's founding on June 24, 1571 by Spanish conquistador Miguel López de Legazpi, was first proclaimed by Herminio A. Astorga (then Vice Mayor of Manila) on June 24, 1962. It has been annually commemorated under the patronage of John the Baptist, and has always been declared by the national government as a special non-working holiday through Presidential Proclamations. Each of the city's 896 barangays also have their own festivities guided by their own patron saint. The city is also the host to the Procession of the Feast of the Black Nazarene (Traslacíon), held every January 9, which draws millions of Catholic devotees. Other religious festivities held in Manila are the Feast of Santo Niño in Tondo and Pandacan held on the third Sunday of January, the Feast of the Nuestra Señora de los Desamparados de Manila (Our Lady of the Abandoned), the patron saint of Santa Ana which was held every May 12, and the Flores de Mayo . Non-religious holidays include the New Year's Day, National Heroes' Day, Bonifacio Day and Rizal Day. Manila—officially known as the City of Manila—is the national capital of the Philippines and is classified as a Special City (according to its income)   and a Highly Urbanized City (HUC). The mayor is the chief executive, and is assisted by the vice mayor, the 36-member City Council, six Congressmen, the President of the Association of Barangay Captains, and the President of the Sangguniang Kabataan . The members of the City Council are elected as representatives of specific congressional districts within the city. The city, however, have no control over Intramuros and the Manila North Harbor. The historic Walled City is administered by the Intramuros Administration, while the Manila North Harbor is managed by the Philippine Ports Authority. Both are national government agencies. The barangays that have jurisdictions over these places only oversee the welfare of the city's constituents and cannot exercise their executive powers. District I (2015 population: 415,906)  covers the western part of Tondo and is the most densely populated Congressional District. It is the home to one of the biggest urban poor communities. The Smokey Mountain in Balut Island is once known as the largest landfill where thousands of impoverished people lives in the slums. After the closure of the landfill in 1995, mid-rise housing buildings were built in place. This district also contains the Manila North Harbour Centre, the Manila North Harbor, and the Manila International Container Terminal of the Port of Manila. District II (2015 population: 215,457)  covers the eastern part of Tondo known as Gagalangin. It contains Divisoria, a popular shopping place in the Philippines and the site of the Main Terminal Station of the Philippine National Railways. 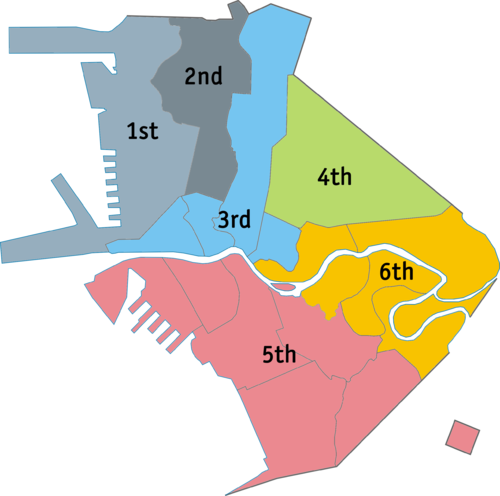 District III (2015 population: 221,780)  covers Binondo, Quiapo, San Nicolas and Santa Cruz. It encompasses the so-called "Downtown Manila" or traditional business district of the city and the oldest Chinatown in the world. District IV (2015 population: 265,046)  covers Sampaloc and some parts of Santa Mesa. It contains the University of Santo Tomas, the oldest existing university in Asia. District V (2015 population: 366,714)  covers Ermita, Malate, Paco, Port Area, Intramuros, San Andres Bukid, and a portion of Santa Ana. The historic Walled City is located here, along with Manila Cathedral and San Agustin Church, a UNESCO World Heritage Site. District VI (2007 population: 295,245)  covers Pandacan, San Miguel, Santa Ana, Santa Mesa and a portion of Paco. Santa Ana district is known for its 18th Century Santa Ana Church and historic ancestral houses. Polytechnic University of the Philippines is located here, the most populous university in the Philippines. One of the more famous modes of transportation in Manila is the jeepney. Patterned after U.S. Army jeeps, these have been in use since the years immediately following World War II. The Tamaraw FX, the third generation Toyota Kijang, which competed directly with jeepneys and followed fixed routes for a set price, once plied the streets of Manila. They were replaced by the UV Express. All types of public road transport plying Manila are privately owned and operated under government franchise. 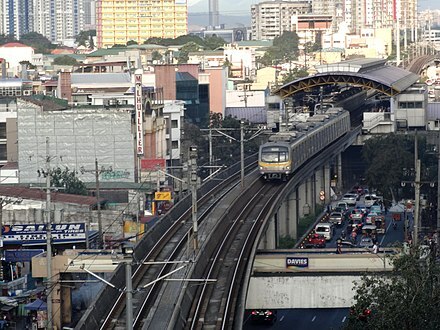 The city is serviced by Line 1 and Line 2, which form the Manila Light Rail Transit System, as well as the Manila Metro Rail Transit System, currently made up of one line (Line 3) with several more in development. Development of the railway system began in the 1970s under the presidency of Ferdinand Marcos, when Line 1 was built, making it the first light rail transport in Southeast Asia, though despite the name "light rail", Line 1 operates as a Light Metro running on dedicated right-of-way. Line 2 on the other hand, operates as a full-metro heavy-rail system. These systems are currently undergoing a multibillion-dollar expansion. Line 1 runs along the length of Taft Avenue (N170/R-2) and Rizal Avenue (N150/R-9), and Line 2 runs along Claro M. Recto Avenue (N145/C-1) and Ramon Magsaysay Boulevard (N180/R-6) from Santa Cruz, through Quezon City, up to Masinag in Antipolo, Rizal. Line 3 runs from Taft Avenue, where it intersects with the EDSA station on Line 1, northward through the eastern part of the city, eventually meeting with Line 2 at Araneta Center-Cubao Station before eventually terminating in the north of the city at North Avenue Station, with plans to extend the line to link up with Roosevelt Station at the northern terminus of Line 1. Water services used to be provided by the Metropolitan Waterworks and Sewerage System, which served 30% of the city with most other sewage being directly dumped into storm drains, septic tanks, or open canals. MWSS was privatized in 1997, which split the water concession into the east and west zones. The Maynilad Water Services took over the west zone of which Manila is a part. It now provides the supply and delivery of potable water and sewerage system in Manila,  but it does not provide service to the southeastern part of the city which belongs to the east zone that is served by Manila Water. Electric services are provided by Meralco, the sole electric power distributor in Metro Manila. The Division of the City Schools of Manila, a branch of the Department of Education, refers to the city's three-tier public education system. It governs the 71 public elementary schools, 32 public high schools. The city also contains the Manila Science High School, the pilot science high school of the Philippines. Rizal, officially known as the Province of Rizal, is a province in the Philippines located in the Calabarzon region, 16 kilometres (9.9 mi) east of Manila. The province is named after José Rizal, one of the main national heroes of the Philippines. Rizal is bordered by Metro Manila to the west, Bulacan to the north, Quezon to the east and Laguna to the southeast. The province also lies on the northern shores of Laguna de Bay, the largest lake in the country. Rizal is a mountainous province perched on the western slopes of the southern portion of the Sierra Madre mountain range. Santa Cruz is a district in the northern part of the City of Manila, Philippines, located on the right bank of the Pasig River near its mouth, boredered by the districts of Tondo, Binondo, Quiapo, and Sampaloc, and Grace Park and La Loma. 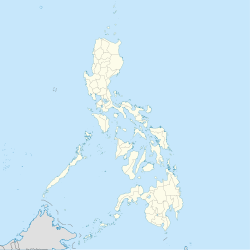 The district belongs to the 3rd congressional district of Manila in the Philippines. In early Philippine history, the Tagalog settlement at Tondo was a major trade hub located on the northern part of the Pasig River delta, on Luzon island. Namayan, also called Sapa, Maysapan or Nasapan, and sometimes Lamayan, was one of three independent polities that dominated the banks of the Pasig River in the Philippines during the 16th century, just prior to the Spanish colonization of the Philippines. In early Philippine history, the Tagalog Bayan of Maynila was a major trade hub located on the southern part of the Pasig River delta, where the modern day district of Intramuros currently stands. Manila's history begins around 65,000 BC the time the Callao Man first settled in the Philippines, predating the arrival of the Negritos and the Malayo-Polynesians. The nearby Angono Petroglyphs, are then dated to be around 3,000 BC and the earliest recorded history of Manila, the capital of the Philippines, dates back to the year 900 AD as recorded in the Laguna Copperplate Inscription. By the thirteenth century, the city consisted of a fortified settlement and trading quarter near the mouth of the Pasig River, the river that bisects the city into north and south. The geography of the City of Manila is characterized by its coastal position at the estuary of the Pasig River that flows to Manila Bay. The city is located on a naturally protected harbor, regarded as one of the finest harbors in Asia. The scarce availability of land is a contributing factor that makes Manila the densest populated city in the world. Manila, also formerly known as Tondo until 1859, was a historical province in the Philippines, encompassing the former pre-Hispanic kingdoms of Tondo and Maynila. In 1898, it included the City of Manila and 23 other municipalities. It was incorporated into the Province of Rizal in 1901. Tourism is an important industry in Metro Manila, Philippines. In 2012, the city and region welcomed 974,379 overnight visitors. As the main gateway to the Philippines' many destinations, the city is visited by the majority of international tourists to the country registering a total of 3,139,756 arrivals in 2012. Global Blue ranked Manila eleventh in its "Best Shopping Destinations" in Asia. The city is ranked tenth in MasterCard's global top 20 fastest growing cities for international visitors from 2009-2013. Plaza San Lorenzo Ruiz or Plaza Lorenzo Ruiz is a major public square in Binondo, Manila, bounded by Quintin Paredes Street to the east and Juan Luna Street to the west, parallel to the Estero de Binondo. 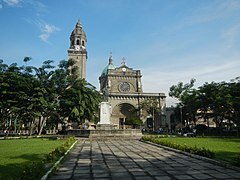 It is the plaza that fronts the Minor Basilica of San Lorenzo Ruiz, one of the main churches of the City of Manila, and is considered the center of Binondo as a whole. Circumferential Road 1, more commonly referred to as C-1, is a network of roads and bridges that altogether form the first and innermost beltway of Manila in the Philippines. The road is located entirely within the city of Manila connecting the districts of Ermita, San Miguel, Quiapo, Santa Cruz, Binondo, San Nicolas and Tondo. 1 2 3 "Enhancing Risk Analysis Capacities for Flood, Tropical Cyclone Severe Wind and Earthquake for the Greater Metro Manila Area Component 5 – Earthquake Risk Analysis" (PDF). Philippine Institute of Volcanology and Seismology and Geoscience Australia . Retrieved May 16, 2016. 1 2 3 4 Census of Population (2015). Highlights of the Philippine Population 2015 Census of Population. PSA . Retrieved June 20, 2016. ↑ Sub-national HDI. "Area Database – Global Data Lab". hdi.globaldatalab.org. ↑ Frank, Andre G. (1998). ReOrient: Global Economy in the Asian Age. Berkeley: University of California Press. p. 131. ↑ Lozada, Bong (March 27, 2014). "Metro Manila is world's second riskiest capital to live in–poll". Philippine Daily Inquirer . Retrieved April 9, 2014. ↑ Cruz, Isagani (December 17, 2009). "The first university". The Philippine Star . Retrieved January 10, 2018. ↑ "A Brief History of Manila Science High School". Manila Science High School . Retrieved January 9, 2018. 1 2 3 4 5 6 7 8 9 10 11 12 Baumgartner, Joseph (March 1975). "Manila — Maynilad or Maynila?". Philippine Quarterly of Culture and Society. 3 (1): 52-54. Retrieved August 20, 2018. ↑ "Tayum". Philippine Medicinal Plants. Retrieved August 20, 2018. ↑ "Ixora manila Blanco". World Marine Species Database. Retrieved August 20, 2018. ↑ Aloma Monte de los Santos (1994). Parish of Sto. Niño de Molino – Bacoor, Cavite – 1984–1994: The Making of a Parish. Parish of Sto. Niño de Molino. Retrieved August 20, 2018. 1 2 Ocampo, Ambeth R. (1990). Looking Back, Volume 1. Anvil Publishing Inc. Retrieved August 21, 2018. ↑ An example is: Saenger, Peter (June 29, 2013). Mangrove Ecology, Silviculture and Conservation. Springer Science & Business Media. p. 19. ISBN 9789401599627. ↑ Mijares, Armand Salvador B. (2006). .The Early Austronesian Migration To Luzon: Perspectives From The Peñablanca Cave Sites Archived July 7, 2014, at the Wayback Machine . Bulletin of the Indo-Pacific Prehistory Association26: 72–78. ↑ Junker, Laura Lee (2000). Raiding, Trading, and Feasting: The Political Economy of Philippine Chiefdoms. Quezon City: Ateneo de Manila University Press. pp. 184–192. ISBN 978-9715503471. 1 2 3 Gerini, G. E. (1905). "The Nagarakretagama List of Countries on the Indo-Chinese Mainland (Circâ 1380 A.D.)". The Journal of the Royal Asiatic Society of Great Britain and Ireland. 37 (July 1905): 485–511. doi:10.1017/S0035869X00033517. JSTOR 25210168. ↑ Globalita: "China's Colonization of the Philippines". ↑ Kane, Herb Kawainui (1996). "The Manila Galleons". In Bob Dye (ed.). Hawaiʻ Chronicles: Island History from the Pages of Honolulu Magazine. I. Honolulu: University of Hawaii Press. pp. 25–32. ISBN 978-0-8248-1829-6. ↑ "Manila (Philippines)". Britannica . Retrieved March 3, 2014. 1 2 Raitisoja, Geni " Chinatown Manila: Oldest in the world" Archived April 2, 2011, at the Wayback Machine , Tradio86.com, July 8, 2006, accessed March 19, 2011. ↑ John. M. Lipski, with P. Mühlhaüsler and F. Duthin (1996). "Spanish in the Pacific" (PDF). In Stephen Adolphe Wurm & Peter Mühlhäusler (ed.). Atlas of Languages of Intercultural Communication in the Pacific, Asia, and the Americas: Texts, Volume 2. Walter de Gruyter. p. 276. ISBN 9783110134179. ↑ White, Matthew. "Death Tolls for the Man-made Megadeaths of the 20th Century" . Retrieved August 1, 2007. ↑ https://www.christianitytoday.com/news/2013/july/missionaries-countries-sent-received-csgc-gordon-conwell.html Christianity Today: "Missionaries by top countries sent or received." ↑ "Milestone in History" Archived March 7, 2016, at the Wayback Machine . Quezon City Official Website. Retrieved April 22, 2013. ↑ Legaspi, Amita (July 17, 2008). "Councilor files raps vs Lim, Manila execs before CHR". GMA News . Retrieved March 4, 2014. ↑ "Mayor Lim charged anew with graft over rehabilitation of public schools". The Daily Tribune . Archived from the original on June 11, 2011. Retrieved June 25, 2012. ↑ "Isko Moreno, 28 councilors file complaint vs Lim". ABS-CBN News and Current Affairs . Retrieved June 25, 2012. ↑ Lopez, Tony (June 10, 2016). "Erap's hairline victory". The Standard Philippines . Retrieved June 22, 2016. ↑ Caliwan, Christopher Lloyd (September 25, 2017). "SC okays curfew for minors in QC, but not in Manila, Navotas". News5 . Retrieved September 27, 2017. ↑ Aberia, Jaimie Rose (September 27, 2017). "Manila city council planning to revise existing curfew ordinance". The Manila Bulletin . Retrieved September 27, 2017. ↑ Aurelio, Julie M. (June 19, 2018). "Roque: No problem if Manila no longer capital under federal gov't". Inquirer News . Retrieved June 21, 2018. ↑ "Geography of Manila". HowStuffWorks . Retrieved March 4, 2014. ↑ Cabuenas, Jon Viktor D. (October 26, 2017). "Waterfront Manila to develop man-made island in Manila Bay". GMA News Online . Retrieved October 26, 2017. ↑ Talabong, Rambo (May 12, 2017). "Manila to relocate 7,000 families in esteros". Rappler . Retrieved June 12, 2017. ↑ See, Aie Balagtas (June 7, 2017). "Erap OKs fourth reclamation project in Manila Bay". Philippine Daily Inquirer . Retrieved June 12, 2017. ↑ "Metro Manila temperature soars to 36.2C". ABS-CBN . Retrieved October 12, 2014. ↑ "Port Area Manila Climatological Normal Values". Philippine Atmospheric, Geophysical and Astronomical Services Administration. Archived from the original on September 19, 2018. Retrieved September 19, 2018. ↑ "Port Area Manila Climatological Extremes". Philippine Atmospheric, Geophysical and Astronomical Services Administration. Archived from the original on September 19, 2018. Retrieved September 19, 2018. ↑ Cappelen, John; Jensen, Jens. "Filippinerne – Manila, Luzon" (PDF). Climate Data for Selected Stations (1931–1960) (in Danish). Danish Meteorological Institute. Archived from the original (PDF) on April 27, 2013. Retrieved September 19, 2018. ↑ Nelson, Alan R.; Personius, Stephen F.; Rimando, Rolly E.; Punongbayan, Raymundo S.; Tungol, Norman; Mirabueno, Hannah; Rasdas, Ariel (2000). "Multiple Large Earthquakes in the Past 1500 Years on a Fault in Metropolitan Manila, the Philippines". Bulletin of the Seismological Society of America. 90 (1): 84. Bibcode:2000BuSSA..90...73N. doi:10.1785/0119990002. ↑ Rimando, Rolly; Rolly E. Rimando; Peter L.K. Knuepfer (February 10, 2004). "Neotectonics of the Marikina Valley fault system (MVFS) and tectonic framework of structures in northern and central Luzon, Philippines". Tectonophysics. 415 (1–4): 17–38. Bibcode:2006Tectp.415...17R. doi:10.1016/j.tecto.2005.11.009. ↑ "Fire and Quake in the construction of old Manila" Archived February 3, 2013, at the Wayback Machine . The Frequency of Earthquakes in Manila. Retrieved November 22, 2013. ↑ Atlantic Oceanographic and Meteorological Laboratory, Hurricane Research Division. "Frequently Asked Questions: What are the upcoming tropical cyclone names?". NOAA . Retrieved December 11, 2006. ↑ Tharoor, Ishaan (September 29, 2009). "The Manila Floods: Why Wasn't the City Prepared?". TIME . Retrieved March 4, 2014. ↑ Alave, Kristine L. (August 18, 2004). "Metro Manila Air Polluted Beyond Acceptale Levels". Clean Air Initiative – Asia. Manila: Cleanairnet.org. Archived from the original on December 3, 2005. Retrieved March 4, 2014. ↑ "Pollustion Adversely Affects 98% of Metro Manila Residents". Hong Kong: Cleanairnet.org. January 31, 2005. Archived from the original on April 27, 2006. Retrieved March 4, 2014. ↑ "Air pollution is killing Manila". GetRealPhilippines. Archived from the original on March 7, 2016. Retrieved June 18, 2010. ↑ Fajardo, Feliciano (1995). Economics. Philippines: Rex Bookstore, Inc. p. 357. ISBN 978-971-23-1794-1 . Retrieved May 6, 2010. ↑ Badilla, Nelson (December 28, 2017). "Quezon City, Manila, Caloocan biggest waste producers". The Manila Times . Retrieved December 28, 2017. ↑ Jenny F. Manongdo (June 13, 2016). "Culture agency moves to restore 'Manila, Paris of the East' image". Manila Bulletin . Retrieved July 6, 2016. ↑ Census of Population (2015). "National Capital Region (NCR)". Total Population by Province, City, Municipality and Barangay. PSA . Retrieved June 20, 2016. ↑ Census of Population and Housing (2010). "National Capital Region (NCR)". Total Population by Province, City, Municipality and Barangay. NSO . Retrieved June 29, 2016. ↑ "Province of Metro Manila, 1st (Not a Province)". Municipality Population Data. Local Water Utilities Administration Research Division. Retrieved December 17, 2016. ↑ "More than 3 million Chinese allowed entry into Philippines since 2016 — Immigration data | Philstar.com". philstar.com. Retrieved October 4, 2018. ↑ Ranada, Pia (January 5, 2016). "A look at the state of crime, drugs in the Philippines". Rappler . Retrieved April 26, 2016. ↑ Aberia, Jaimie Rose (October 2, 2017). "Crime rate in Manila drops by 38% for past 12 months". Manila Bulletin . Retrieved December 5, 2017. ↑ Casas, Bill (August 22, 2017). "MPD is top NCR police district". Manila Standard . Retrieved March 3, 2018. ↑ "Manila churches under tight guard". The Manila Times . December 15, 2016. Retrieved December 21, 2016. ↑ "Rankings". Cities and Municipalities Competitiveness Index. Archived from the original on January 10, 2017. Retrieved January 9, 2017. ↑ Rex Remitio (July 17, 2015). "Manila is Philippines' most competitive city – NCC". CNN Philippines. Archived from the original on August 18, 2016. Retrieved July 19, 2016. ↑ "Asia's 200 Best Under A Billion: International Container Terminal Services". Forbes . September 27, 2007. Retrieved October 22, 2008. ↑ "Estrada: Oil depot closed by July 15". The Philippine Daily Inquirer . December 16, 2014. Retrieved February 5, 2015. ↑ "Pandacan oil depot 'decontamination' pushed after Big 3 exit". The Philippine Daily Inquirer . December 21, 2014. Retrieved February 5, 2015. ↑ Andrade, Jeannette (December 1, 2007). "Lino Brocka, 3 others installed on remembrance wall". Philippine Daily Inquirer . Archived from the original on May 2, 2014. Retrieved July 28, 2013. ↑ "10 Best Places to Visit in Manila with Kids". Gofamgo. ↑ Jovic Lee (July 20, 2014). "Intramuros cocheros: Hooves, history and hope for a fare hike". INQUIRER.net . Retrieved March 23, 2015. ↑ Edgardo S. Tugade (June 1, 2014). "Challenges to PH medical tourism". The Manila Times . Retrieved October 27, 2014. ↑ "Miss Earth candidates visits 100 Revolving Restaurant" . Retrieved January 12, 2012. ↑ "Manila: Sports" . Retrieved January 15, 2010. ↑ Talao, Tito (March 10, 2004). "Baseball loses no time in preparing for SEAG". Manila Bulletin . Archived from the original on September 13, 2012. Retrieved March 4, 2014. ↑ "2017 Annual Financial Report of Local Government Units (Volume I)". Commission on Audit . Retrieved November 7, 2018. 1 2 "2017 Annual Financial Report of Local Government Units". Commission on Audit . Retrieved November 6, 2018. ↑ "2015 Annual Financial Reports for Local Government Units (Volume III)". Commission on Audit . Retrieved December 1, 2016. ↑ Santos, Reynaldo Jr. (October 24, 2013). "Barangay in numbers". Rappler . Retrieved April 27, 2016. ↑ Macairan, Evelyn (August 15, 2007). "Manila councilor wants fewer barangays". The Philippine Star . Retrieved April 27, 2016. ↑ Clapano, Jose Rodel (September 18, 2016). "Manila: No more trikes, pedicabs next month". The Philippine Star . Retrieved September 19, 2016. ↑ Coconuts Manila (September 18, 2016). "Manila will say goodbye to old school tricycles and pedicabs on Oct 15" . Retrieved September 19, 2016. ↑ "Waze – Official Blog: Global Driver Satisfaction Index" . Retrieved August 12, 2016. ↑ "World's Densest Cities" . Retrieved October 25, 2012. ↑ Tomas S. Noda III (January 28, 2015). "DMCI gets $51.5m rail contract in PH" . Retrieved February 1, 2015. ↑ Rodel Rodis (October 23, 2014). "Manila's traffic jams cost $57 million a day" . Retrieved March 20, 2015. ↑ Joel E. Surbano (January 3, 2016). "Manila hospital going for upgrade". The Standard . Retrieved January 3, 2016. ↑ Jaime Rose R. Aberia (August 6, 2017). "World-class hospital to rise in Manila for cleft lip, palate patients". Manila Bulletin . Retrieved August 7, 2017. ↑ Rosabell C. Toledo (August 6, 2017). "Manila mayor eyes founding of PHL's first 'world-class' cleft-palate facility". BusinessMirror . Retrieved August 7, 2017. ↑ Cris G. Odronia (February 25, 2017). "Manila intensifies free immunization program". Manila Bulletin . Retrieved February 25, 2017. ↑ Rosabell C. Toledo (July 10, 2017). "UN lauds free dialysis center in Manila". BusinessMirror . Retrieved July 15, 2017. ↑ Dexter Cabalza (July 9, 2017). "Dialysis center for Manila's poor cited by UN body". Philippine Daily Inquirer . Retrieved July 15, 2017. ↑ "PUP: Profile". Polytechnic University of the Philippines. March 30, 2011. Archived from the original on June 21, 2014. Retrieved March 4, 2014. ↑ Jaimie Rose Aberia (August 16, 2017). "Manila, Bacoor sign sister city accord". Manila Bulletin . Retrieved August 16, 2017. 1 2 "Overview of China-Philippines Bilateral Relations: III. Exchanges and Cooperation in the Fields of Culture, Education, Science and the Military, etc". Embassy of the People's Republic of China in the Republic of the Philippines. March 5, 2009. Retrieved February 4, 2015. 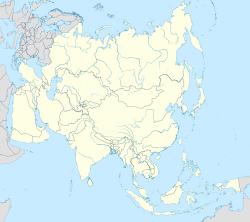 There are 24 pairs of sister-cities or sister-provinces between China and the Philippines, namely: Hangzhou and Baguio City, Guangzhou and Manila City, Shanghai and Metro Manila, Xiamen and Cebu City, Shenyang and Quezon City, Fushun and Lipa City, Hainan and Cebu Province, Sanya and Lapu-Lapu City, Shishi and Naya City, Shandong and Ilocos Norte Province, Zibo and Manduae City, Anhui and Nueva Ecija Province, Hubei and Leyte Province, Liuzhou and Muntinlupa City, Hezhou and San Fernando City, Harbin and Cagayan de Oro City, Laibin and Laoag City, Beijing and Manila City, Jiangxi and Bohol Province, Guangxi Zhuang Autonomous Region and Davao City, Lanzhou and Albay Province, Beihai and Puerto Princessa City, Fujian Province and Laguna Province, Wuxi and Puerto Princessa City. ↑ Todeno, Junhan B. (June 17, 2012). "Flores forges sister city ties with Manila". Marianas Variety . Retrieved November 10, 2015. ↑ "Twin Cities plan will boost Malacca". New Straits Times . Retrieved July 9, 2013. ↑ "Winnipeg's Sister Cities: Manila (Maynila), Philippines (Republika ng Pilipinas)" . Retrieved June 2, 2015. ↑ "Manila-Acapulco Galleon Museum rises in SM MOA". businessmirror.com.ph.